Such perfect mastery of time and rhythm perhaps unequaled in cinema. A chamber drama with few scenes, each austerely captured by the observing and detached gaze of a languid camera, which carefully tracks the actors deeply nuanced performances in long takes. With each new setting is the beginning of a sequence shot; a silent pause before and after each cut enhances the elliptical nature of the storytelling in spite of its real-time drama. In near silence, the actors and camera move about each setting as embodied creatures belonging to life and its constant presence of time passing, both symbolically and physically expressed by the ticking clock, which moves left, right, left, right, just as Dreyer’s camera slowly rotates or pans left, right, left, right, creating a visual ticking clock with the actors as its hands: Anders shifts from right to left seat at the table, Johannes turns his head as the rotating camera glides to his other side. There is a great balance and composure in Dreyer’s cinematography, often boasting visual symmetry, parallels, and balance. When the clock is stopped, Inger enters the eternal presence of God. For a while, the soundtrack loses the the tick-tocking which held the characters fastened to their corporeal world. The absence of time’s ticking clock brings with it notions of God’s eternal presence, which is presented both visually and aurally through cinematography and soundtrack—zooms and pans instead of rotation, high contrast black and white of faces in close-up, silence rather than the ticking clock. Until at once she arises, the darkness disappears into light, and the clock’s ticking begins again. Though highly nuanced in tone and cinematic language, Ordet narrates a more blatant defense of God through its dense script. The clever and spiritually resonant dialogue conveys the films beliefs and integrity without ever becoming patronizing or heavy handed. Though Dreyer’s intentions and religious fervor are unambiguous, and it is absolutely clear from the beginning where his stance lies, Ordet’s subtlety and the metaphorical possibilities of religious revelation speak of humanity and of humility much more than of religion itself. The miraculous event transforms hypocrites and lukewarm believers into men of true faith. The man once condemned to a life of solitude and madness rises with the strongest faith in the Kingdom of Heaven, that of a child. Through his faith, the resurrection not only of Inger but of the old world wherein God was wholly believed brings the warmth of life and the glow of God’s eternal presence into their cold, skeptical, doubting human hearts. The revived woman embraces and shares the flesh of her lover, reborn into the joy of the corporeal world which God created, taketh her away, and returned upon her. Her agnostic husband now a believer shares a smile, understanding finally his wife’s faith, thus bringing God’s presence into his heart. He accepts now that his deceased son is alive at home in the Kingdom of Heaven. As well, a Christian ‘heathen’ and a fundamentalist whose hatred is spurned by a lack of identical faith are brought together at this sudden and shared revelation of the God of old, the same God for which their faith proclaimed, however diversely it lead religious practice. Each in awe of God’s glory, the tone of the room changes. No longer does one feel the negative or impure thoughts stemming from a lack of faith, from doubt, disbelief, or skepticism. Though the clock continues to tick, and the men live in the corporeal world of time passing, the eternal presence of God remains with them. 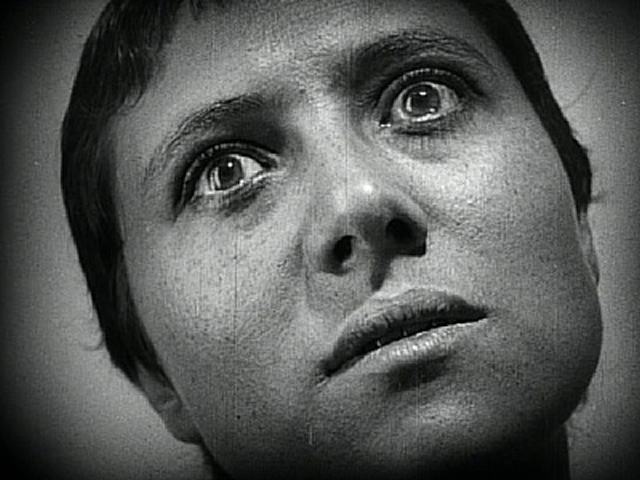 Finally, the spirits of these believers becomes equal to the realization of God in Dreyer’s cinematography. The characters warm feelings of God’s presence is tantamount to the warm, silent expression of Dreyer’s rhythmic sense of time and eternity. As with the film, the characters have finally found humility and peace. The austerity of Ordet, its sense of balance, simplicity, humility, and unaffectedness, becomes a part of the characters’ experience, and so too does it become part of the viewers’ transformative experience musing Dreyer’s masterwork. This entry was posted in Reviews and tagged agnostic, Art, best movies of all time, black and white, carl theodor dreyer, christ, christian, Cinematography, clock, Contemplation, cross, danish, denmark, destiny, dreyer, eternity, faith, farm, fate, Foreign Film, fundamentalist, ghost, God, gods, jesus christ, kingdom of heaven, Life, long take, lord, madness, Meditation, mental disease, mental illness, mindfulness, Mise-en-scene, Movies, ordet, prayer, presence, psychosis, Religion, resurrection, revelation, revival, Spirit, Spirituality, sweden, ticking clock, Transformation, word, yin and yang. Bookmark the permalink.